Hat for adult small (medium, large) – approximately 18 (19½, 21)” head (unstretched), to fit roughly a 20 (21½, 23)” head circumference. 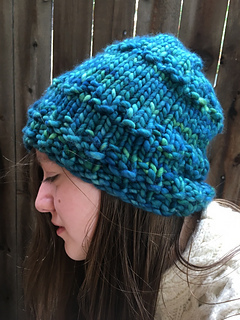 This hat will be done in the blink of an eye – it is so fast to knit! Sizes: Hat for adult small (medium, large) – approximately 18 (19½, 21)” head (unstretched), to fit roughly a 20 (21½, 23)” head circumference. 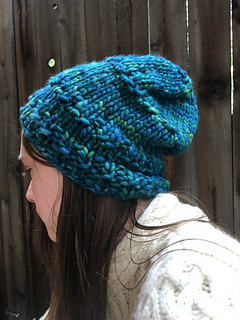 Sample hat shown in sizes small and large. Fit is intended to be slouchy. • 1 skein Malabrigo Rasta (100% Merino; 90 yards, 150g) or similar super bulky yarn. Small sample shown in Solis and large sample shown in Porrinho. The largest size uses the entire skein of yarn. 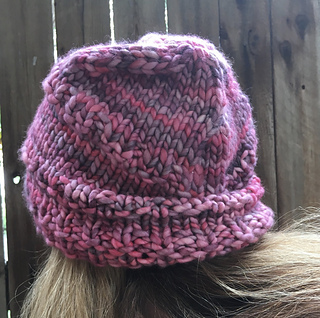 Gauge: 9 sts and 15 rows = 4” in stockinette. Check your gauge!